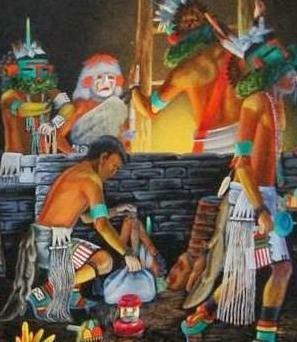 Here is a Hopi Candle Night ritual scene by the modern artist Raymond Naha, in hyper-realistic style (compare to peyote- or mescaline-styled art, and ayahuasca-styled art, and other old and modern Hopi artworks, at https://mindprintart.wordpress.com/2016/10/02/peyote-or-mescaline-art/ ); and to a Dogon ritual mud relief mural. Universal, archetypal features in these works are demonstrated below. The characters are not ‘constellations’. Art, and probably all cultural media, is sustained by individual and social compulsion to re-express a specific set of features, in apparently different styles. Hopi Candle Night ritual, by Raymond Naha. Members and students would recognise some stock kachina characters, rituals, and items. Structuralist analysis could reveal five layers of subconscious ‘design’ here, and in any artwork. Dogon mud relief mural, re-modelled and re-painted every year. Astronomers could not find a comprehensive star map in Dogon art, ritual or myth. Five layers of structure indicate that artworks and other media are archetypal, thus subconscious. See the section on initiation below. Hopi Candle Night ritual (Raymond Naha. Typology labels and axial grid by Edmond Furter). The work is homogenic (one species, one activity), and minimalist in structuralist terms, yet still the number of predictive universal cultural features is within the predicted range. Dogon mud relief mural in Mali (after Michele Afeirei. Typology labels and axial grid by Edmond Furter). The number of predictive universal cultural features is within the predicted range. Hopi dance ritual scene by Raymond Naha (axial grid between eyes and two focal points by Edmond Furter, indicating that the usual typology is present, in the standard sequence, with the standard polar features and time-frame markers). See a list of the standard labels, and standard caption format, in some other posts. Artists, members and students of any culture, could now identify archetypal features in any artwork, by using the axial grid between eyes, and the list of known recurrent archetypal features and spatial elements (Furter 2014, 2016). The Dogon mural is often photographed by tourists, and explained by Dogon guides as “astronomical”. Two astronomers who visited here in 2009 believed the guides, but could not explain how Dogon art relates to Western constellations. They noted that meteor showers and comets were somehow involved, but assume that the “knowledge” is “lost”. Structuralist analyses of this Hopi artwork, and this Dogon artwork, are posted above. There are cosmic elements in culture, but direction, season and myth are not primarily astronomical. Cultural media contain a kind of secret that is difficult to divulge, because it runs against common assumptions. Eleusis in Greece never published its secrets, because it traded in ritual experience, pilgrimage, stories, emotion, perhaps drugs, and tribal bonding. These are not recordable in conscious terms. Rites of passage are not philosophy, science, or oracles. Initiation implies ‘transfer’ of ‘knowledge’, but this view is doubly misleading, unless the initiate realises that the system grants permission to express his or her own inspiration, and incidentally to re-calibrate and maintain the social system. Tribal initiation carries a mixture of history, politics, legend, myth and religion, partly to maintain spiritual authority. In 1931 some Dogon elders started explaining at a simple level at Ogol, a double village. Sanga region totemic priests were involved in the counter-missionary ritual. Ogotemelli explained for 30 days at first, stretching into years. A successor followed up. The subject of water gods alone required several days of a meandering flow of information (Griaule 1965; Le Renard Pale). The elders probably adapted spiritual visions to political and diplomatic strategies, as shamans always do. The supposed ‘knowledge’ is not in rational form, but coded in myth and art, some in sand drawings and some on buildings. Disguise and camouflage is part and parcel of inspiration and expression, since conscious questions and answers could not reveal the full context of subconscious structure. Initiation is understood as secrecy, while it implies a different rationality. Those of ‘ready mind’ are encouraged to see the vision themselves. Days of explanation prompt the candidate’s own inspiration. It takes time to unlearn common sense. Initiates require tribal bonding and some assurance and permission to graduate. It could take years of membership, or rambling by a healer, to unlearn supposedly logical assumptions and to see the pattern implicit in shapes and everyday attributes. Culture, like race, is a state of mind. Dogon, Amerindian, and other sand drawings, typically cruciform and axial, get some teachers and initiates in the right frame of mind. Anthropologists took the spiritual tales as ‘accumulated tradition’, as popular culture understands sacred books. They had assumed the stories to be motivated by events, and sustained by memory and records. But prevalence of the identical subconscious imprint in all cultural media or all eras, indicate that there is no conscious, unbroken, astronomical, astrological, iconographic, alchemical or artistic tradition in any culture, nor worldwide. The eternal source is our compulsion to re-express archetypal structure in all our media.